Shirts With Random Triangles: Alabama suspends three players for "violation of team rules." "Our focus is here, we have a lot of good players, a lot of good people, in our program, a lot of guys that really do a lot of good things on and off the field," Saban said. "We're certainly focused on those guys that we have here to develop them to be the best players that they can be, because they've demonstrated they're willing to do the things they need to do and football is important enough to them to do the things they need to do to have a chance to be successful." 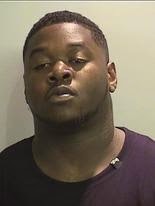 Reed was arrested in July on a DUI charge after the vehicle he was driving was involved in a crash with another vehicle.